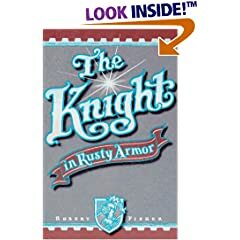 I just read The Knight in Rusty Armor by Robert Fisher and I must say it's one of the most meaningful stories I have read for a long, long time. Fisher skillfully uses various elements in the story as metaphors for the challenges we face in life and embeds enriching lessons we should all learn so as to help us find more clarity in this seemingly complicated world. The hero of the story is a knight who led a busy life fighting battles, slaying dragons and rescuing damsels in distress because he wanted to prove that he was good, kind and loving. He loved his armor so much that he decided to keep it on at all times, so much so that his faithful wife Juliet and young son Christopher forgot how he looked without it. When he finally reluctantly acceded to take off his armor for fear that his wife and son would leave him, he realized that he couldn't remove it. He had kept it on for so long that it was stuck on him. The knight subsequently set off on a difficult and punishing quest to remove his armor and in the process, he rediscovered his true self and the meaning of life. I absolutely love this story because I can relate to it so well. The rusty armor is a metaphor for the masks that we put on in life. Our masks protect us but they also prevent others and especially ourselves from seeing the real us. Most of us have adopted social masks for so long that we believe we are those masks. But the fact is we aren't. We were all born with the greatest potentials but along the way, most of us sell ourselves short. The Knight in Rusty Armor also touches on the theme of love, and advocates the timeless saying that in order to love others, we must love ourselves first. I highly recommend this book (It's only $7!) because the lessons within are going to touch the very core of your hearts. I know… because they have already touched mine. Great Post! Keep up the excellent word. I await more updates and reviews from you!